There has been a lot of chatter this morning about how non-commercial or speculative euro positioning turned positive for the first time in 8 weeks. But some people may be wondering, what does this really mean? To answer this question, I put together the following chart. 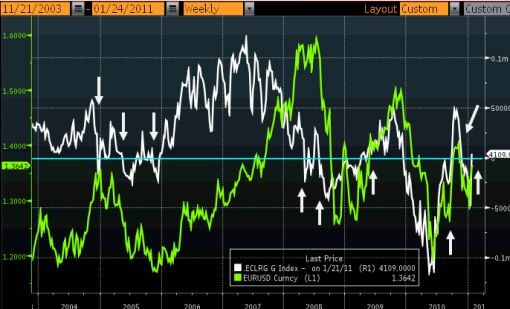 The Green Line is the EUR/USD and the White Line is net EUR spec positions according to the CFTC. The arrows point to the instances where positioning has shifted from negative to positive or vice versa. As you can see, more often than not, the “turn” in net positions has led to a continuation move in the currency. The initial move towards zero represents people getting stopped out (we saw this last week) and then the spec positions grow in favor of the new direction as more traders join in on the move. Therefore based upon the COT data, the EUR/USD rally could continue. The next level of resistance in the EUR/USD is 1.3750, the 61.8% Fibonacci retracement of the November to January sell-off.